The Sea Harrier is VTOL/STOVL (Vertical Take-Off and Landing/Short Take-Off and Vertical Landing) naval jet fighter, reconnaissance and attack aircraft, based on the Harrier, that served with the British Royal Navy during the Falklands War. During the war, Sea Harriers operated mainly in their primary role, air defence, but also performed some ground-attack missions, although the majority of ground-attack missions were carried out by RAF Harrier GR.3s. 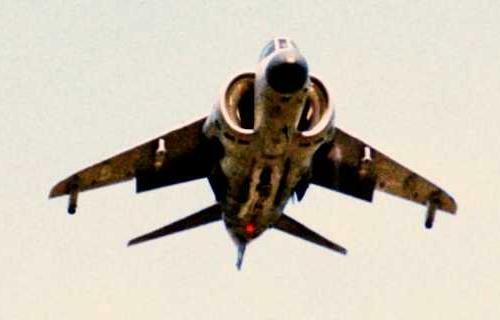 Sea Harriers shot down 21 Argentine aircraft in air-to-air combat, without suffering any losses (although two Sea Harriers were lost to ground fire, and four to accidents), despite being greatly outnumbered. The Sea Harrier's success during the war can be attributed to a number of factors, including its much greater manoeuvrability than Argentine jets, its AIM-9L Sidewinder missiles, the Blue Fox radar, the fact that Argentine jets had limited endurance over the Falkland Islands because they lacked local bases and air-to-air refueling capability, and because of the superior training of British pilots.